FOAM LAKE BIRDING No. 36. This is a first for me – writing directly from afar. My California articles were written in Foam Lake before we left for Carlsbad. As a result my vacation time was free, as it were. In this case, I will be writing from the Rio Grande Valley in southern Texas (where the temperatures presently range from 20C to 35C). Another first is that I will be using the internet to get these articles to the Foam Lake Review. Hopefully, everything works out well. This week’s featured bird is very common throughout all of the wooded areas around here. However, most of the land has been cleared for agriculture which obviously has had an effect on the birds themselves. Therefore most of the birds are concentrated in nature preserves, although, some ranchers/farmers are nature lovers and have good stands of bush on their properties with resultant bird populations. The birds look like dingy brown pheasants, but are only distantly related to them and the chicken family as a whole. The Chachalaca (pronounced cha-cha-la-ca), though common, is very difficult to spot in the wild. Hunting them for food by peasants has made them very wary of humans. The birds live in small flocks feeding on the forest floor, but roost in trees like chickens or turkeys. In fact, except for feeding, they spend almost their entire time in trees where they are very agile and silent – much like squirrels. One could be in the middle of a flock of Chachalacas and not be aware of it! The only way to get a really good look at them is in wildlife preserves and parks where they have become quite tame. 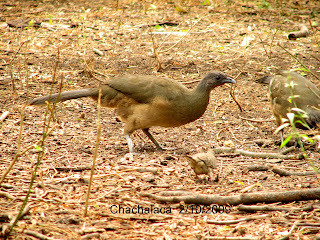 The Chachalaca gets its name from its loud and distinctive call – cha cha lac, usually given in the morning or evening. While roosting, one of the dominant birds lets out a loud cha cha lac, whereupon the rest of the flock joins in the chorus (racket). This can continue for several minutes, followed by a period of silence to be followed by a repeat performance. It is quite an experience to hear them. It could be compared to the gobbling domesticated turkeys make when they are startled. The Aztecs called the bird “he who will not stop talking”. This week’s photo shows two Chachalacas and an Inca Dove (very common throughout the Southwest) eating seeds that have been spilled by Cardinals and House Sparrows from a feeder hanging directly above. I tried to get the muskrat-sized Fox Squirrel in the picture, but squirrels and Chachalacas do not like each other very much so I could not get a good picture with both of them in it. In closing this first “Texas” article, I would like to point out that the lower Rio Grande Valley is very Mexican in all aspects – the people, the plants and animals. The birds that I will be writing about are found here and nowhere else in the USA or Canada. I should also point out that many summer residents of the Foam Lake area, especially water fowl, winter here, however, I will write about them when they have migrated back to the Canadian prairies. 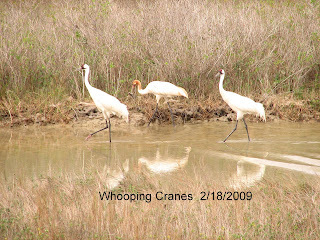 In the meantime, I hope you find these articles about the Rio Grande birds interesting. Adios from southern Texas. It was never my intention to do a repeat article on a particular bird. However, an extraordinary event this past week made me do just that. 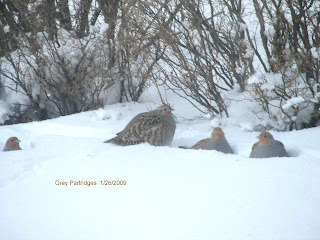 In my last article, I had written about a flock of nine Grey Partridges (Huns) landing in our neighbour’s front yard. Several days later, about 5:15PM, I was sitting in our living room when I noticed a flock of “little chickens” walking on the deep snow in our front yard. They were Huns alright – probably the same ones that I had written about last week. I did not see them land; I just saw them walking leisurely from north to south. 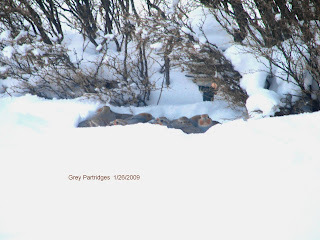 When they got to the hedge on the south side of our yard, they slowly gathered into a cluster of birds partially buried in the soft deep snow. They were still there when it was getting quite dark. It appears they spent the night there. I got several pictures of them just as the light was starting to fade for the evening. 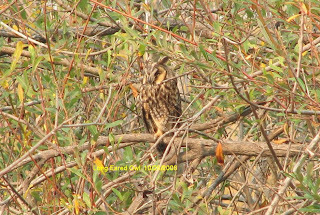 As a result of the poor light, the pictures are not of the best quality, but they more than adequately capture an unusual event in the birding world. I, also, got several shots of the Huns before they gathered to roost for the night. 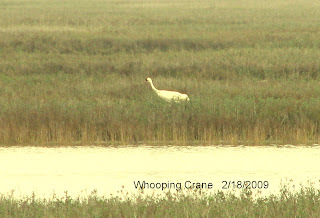 One of the photos (of several walking birds) came out in quite good resolution. However, I decided to publish the picture of them huddled together like a bowl full of perogies. They simply looked cute! It does appear that Foam Lake just might have its own family of Huns that do not mind (perhaps, even like) human presence. I certainly hope so. The high winds of this past week knocked one of our niger seed feeders down. When it fell down the lid came off, but only a few seeds actually spilled onto the snow. It was quite comical watching a Redpoll “walking” into the open end of the feeder in order to get at the niger seed inside. Last week we drove to Humboldt for a weekend visit. On our way there, about halfway between Dafoe and Watson, we saw a beautiful Snowy Owl sitting on a power post. Unfortunately, I did not have my camera with me. It would have made a terrific picure. Finally, I want to announce that I now have my very own website that contains all of the Foam Lake Birding articles. It is current. The site also has all of the photos that appear in the Foam Lake Review except that they are not cropped and in full colour. In addition, I have usually added another picture or two to each article that, for reasons of economy, cannot appear in the local newspaper. For example, my article on the Northern Shrike stated that it had just killed a Redpoll that lay in a heap on the snow beneath it. The newspaper article had the Redpoll cropped out; the website shows it as described in the write up. In addition, I also included another picture of the Shrike sitting on a branch with the Redpoll impaled on a thorn right beside it. It simply adds to the event.